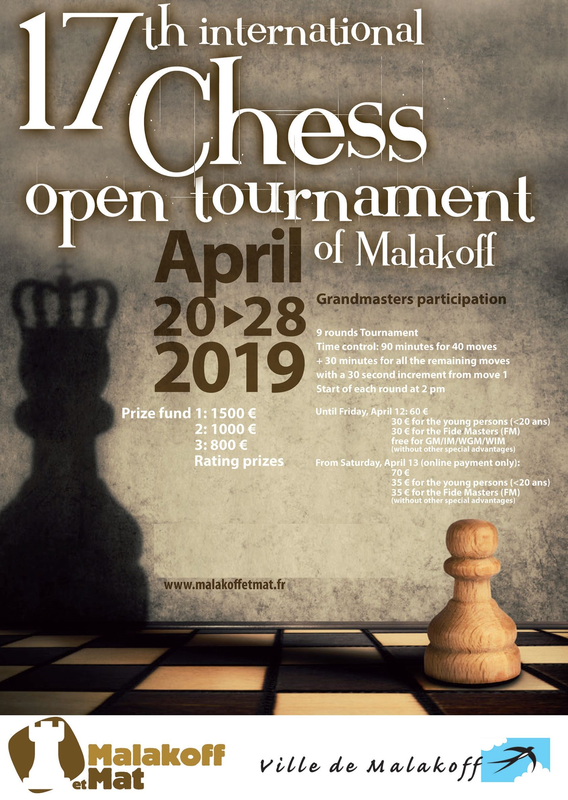 The Malakoff et Mat club organises its traditionnal chess open from saturday 20 to Sunday 28 april 2019. This is a nine rounds tournament in 9 days (no double round) with a time control of 90 minutes for 40 moves + 30 minutes for all the remaining moves with a 30 second increment from move 1. New Tournament hall allows the admittance of 400 players in a good condition. Rooms are located in the middle of Malakoff near a Subway station of Paris allowing chess and tourism. Registration fees is 60 euros/30 euros for the young persons (U20) and Fide Master. Registration and securized payment via internet. Organization : "Malakoff et Mat"
Prizes : 1st prize 1500 euros; 2nd 1000 euros; 3th 800 euros. Rating Prizes - truncated Buchholz split. Regulation : The official regulation of the tournament will be posted in the tournament hall. Arbiter : John LEWIS, International arbiter. Bus 323 stop 'Henri Barbusse'. Bus 191 bus stop 'Hoche' or 'Henri Barbusse'. 3) Guests, GM, IM, WGM, WIM, registration by email. Starting April 13: Online payment only. April the 20th before 1h00 PM, payment on site, subject to availability : check and cash.